The famine in Ireland lasted from 1845 to 1851 and it was a disaster of unimaginable proportions. Over 1 million people died of starvation and disease and another 1 million emigrated from the country--that was out of a population of just over 8 million. The lasting effect is that Ireland is the only major European country of any size that has a smaller population today than it had 100 to 150 years ago--something like 4.5 million in the North and South combined today. At the time Irish society was dominated by a landlord class that was overwhelmingly Protestant, Anglo-Irish and with many absentee landlords who didn't even live in the country, occasionally visited their estates or in some cases never saw the estates and the lands that they owned at all. The vast majority of the population eked out a living on the land, on plots where they grew food to pay rent, and grew the potato in order to survive. As much as 93 percent of the land was divided into plots of less than 30 acres with 135,314 people living on plots of less than one acre and 319,000 people on plots of less than five acres. The competition for land made rents very high--around 80 percent higher than in England. With such a division of land the potato became central to the survival of the bulk of the population. All other crops grown were used to pay rent, but for people on these extremely small plots of land the potato was easy to grow cheaply in large quantities, and provided an adequate subsistence. To grow any other crop of the same size would have required an acreage six or seven times the size that most of the population lived on. Therefore the impact of the potato blight in 1845 was absolutely devastating. The blight was actually a fungus which spread rapidly when there were high levels of rainfall and which turned entire potato fields black and left the potato itself completely inedible. Since the 1801 Act of Union Ireland was integrated fully into Great Britain. How the government responded in those circumstances was to be vital. 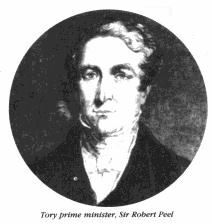 The prime minister when the famine broke out was a Tory, Sir Robert Peel. Peel's response was first of all to abolish the Corn Laws' which had held the price of British corn artificially high, amidst much opposition from his own party. He also authorised an indirect government purchase of £100,000 worth of maize, to be specifically used for Ireland, which would be thrown on the market at any time when the prices looked like they were rising, in order to draw them down. He set up a relief commission to raise money from landlords and also to encourage them to employ the peasantry on their estates in other forms of work, in order that they might meet the crisis. He also introduced a board of works to create employment by building new roads and other public construction. In fact these measures were only marginally successful. First, the repeal of the Corn Laws did drive prices down, but they were still far too expensive for most of the Irish population. It also drove down the value of the corn that the peasants themselves were growing and therefore greater amounts of corn had to be used to pay the landlords' rent. The amount of maize imported, £100,000 worth, was nowhere near equal to the task when the total loss of the potato crop was worth £3,500,000. The amount of public works could nowhere near satisfy the number of people who now desperately needed employment, nor could they be quickly put in place. The works that did exist had to be largely financed by the local rates. The rates had historically been very, very difficult to collect. Indeed in the past rate collectors had had to be escorted by large numbers of soldiers and on occasions warships had to be placed off the coast in areas where the rate was to be collected. Yet the government saw the rates as being the main source of revenue to pay for the crisis. The fact is that the landlords by and large wouldn't pay the rates, the larger farmers, including the native Catholic larger farmers, wouldn't pay the rates and the small plot holders quite simply could not pay the rate that was being demanded of them--they had absolutely nothing. Finally, the maize was not only of an insufficient quantity, but it arrived late, was difficult to store, and needed to be milled twice to make it edible. But perhaps Peel's worst contribution to the whole process was the man he appointed in charge of the operation, Charles Edward Trevelyan--a man who became absolutely synonymous with the policy of the British and the starvation of Ireland. He was the permanent head of the treasury and a dogmatic free market Liberal. Peel's inadequate measures left many completely pauperised, but actually the numbers who died were relatively small, compared to what was to happen later. In other words we're going to leave things as they are to market forces and even cut the limited amount that was done by the Peel government. And therefore they promptly announced that the following would happen--all government food depots which had become crucial in 1845 to feeding sections of the population would now be closed, apart for some special cases in the west of Ireland. Public works should continue, but would now have to be entirely paid from the local rate in Ireland--that's the uncollectable rate. Meanwhile the export of food from Ireland was not to be hampered in any way, shape or form. And so food was being exported whilst people were starving. In 1848, however, there was a complete failure of the crop once again and with it came complete and final ruin. In response the government decided that nothing could be done. With people facing absolute starvation, they decided to close the soup kitchens they had opened two years earlier. To add to the misery, there were two other great disasters both as a result of the famine. The first was typhus. The poverty, the dirt and the starvation meant that it spread to kill hundreds of thousands of people. It was carried through head lice and, in the main, was incurable. There were insufficient hospitals to deal with it. People were dying in the streets in their thousands. Again little or nothing was done by the government. The second disaster was emigration--to both Britain and America. This began in earnest in 1847 and was the emigration of the desperate. Many emigrants were dying as they walked on board the ships. The ships themselves were ill equipped, with insufficient rations of food or water. Many people walking onto those ships were walking to their deaths. Emigrants clearly suffering from typhus were allowed onto the ships, so that many of the ships became floating disease carriers. Thousands upon thousands died. Many 1andlords were delighted to push their tenants on to, these ships, because in the past they were happy to populate their land heavily with peasants and collect lots of rent, but peasants without rent were of no use whatsoever. One landlord commented, 'I got rid of crime and distress for £3 10s a head.' Thus he described sending such people to their deaths. Indeed, the behaviour of the landlords added greatly to the misery and despair which took place. The vast majority failed to help their tenants in any way whatsoever. Worse than that, they compounded the misery by carrying out the evictions of tenants--essentially passing a sentence of death upon them. Around half a million families were evicted by the landlords, many of them in the bitter winter of 1846-47 at British army gunpoint. The landlords became absolutely despised. So who was to blame for the potato famine? There was an old Irish saying that said, 'God gave us the potato blight, but the English gave us the famine.' There is no doubt that the behaviour of the landlords played a significant part, and it can be added that the behaviour of larger Catholic farmers also left much to be desired, many of them becoming even bigger as a result of the clearances that took place. But the British government's role was the crucial one. And it is precisely that role that a school of Irish revisionist historians are trying to play down. Roy Foster in his book Modern Ireland makes light of the historical import of the famine. He argues that it wasn't the main reason for Irish depopulation, emigration was already taking place and people would have left anyway. The British government was trapped by the economic theories of laissez faire, and the fact that it was Ireland had little influence on government policy. They would have behaved the same if it had been England or Scotland, he claims. Do these theories stand up? Well, the first point seems extraordinary. Yes, there had been a growing rate of emigration prior to the famine, but the rapid rate that followed is unimaginable. After all, the population fell by something like a third in little more than half a decade. What of the argument that the fact that it was Ireland was irrelevant and that part of the Irish national myth is that somehow Ireland was being victimised? 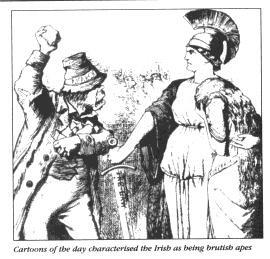 The fact is that newspapers, politicians' speeches and statements from the aristocracy all completely contradict the notion that anti-Irish prejudice wasn't involved. just two examples of what was a fairly typical attitude will suffice. Trevelyan wrote the following, 'The great evil with which we have to contend, is not the physical evil of the famine but the moral evil of the selfish and perverse and turbulent character of the Irish people.' Again another quote from the master of Balliol recalls the day he came to hate British economists when one said that he feared that 'the famine of 1848 in Ireland would not kill more than a million people and that would scarcely be enough to do much good.' The political economist in question was Nassau Senior, one of the government's advisers on economic affairs. What then of the generous amount of money that the British spent? The total government expenditure was £7 million. Contrast that with on the one hand the £20 million that was spent, some years before the famine, in compensation to slaveholders after the end of slavery in the West Indies, and on the other the £70 million that was spent on the Crimean War some years after the famine. Which leaves us with one final argument, the argument about the market, that people were caught in the economic orthodoxy of the day. There is no question that the fact that the British wouldn't intervene on the basis of these policies was devastating. So for instance by refusing to ban food exports, tens, perhaps hundreds, of thousands of people who could have been saved starved to death. There is no question therefore that the policy of the government was fundamentally one which led to the disaster. Yet the orthodoxy itself existed to aid and justify the class which held power, privilege and wealth within society. It almost certainly would have been dropped if necessity had dictated it in an English context or in the context of war. The reality is that there was no great need on behalf of the British to save the Irish poor. They posed little real threat while they were starving. They carried no electoral weight within British society. They were despised and anyway were seen as feckless, rebellious and overpopulated. Britain may have not intentionally engineered the famine, but had little incentive to combat it, and in the end could see it as quite fortuitous. Marx described how in the conquest of Ireland by Cromwell Catholics were replaced on the land, supplanted by Protestants, but after the famine Britain supplanted the native Irish with cattle. In truth that was the situation. Today's revisionists urge us to play down or forget the famine, saying that to rake over the past in this way is out of step with the peace process. So the fate of millions of Irish and the grotesque behaviour of the British government should he swept neatly under the carpet. Such an insult should never be added to the unimaginable injury that was the Irish famine.